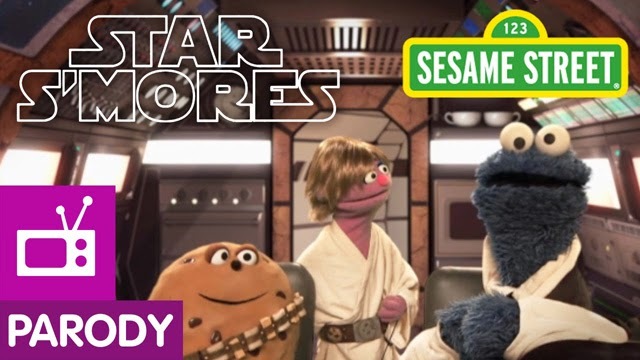 The Best SESAME STREET Parodies | Warped Factor - Words in the Key of Geek. You may really want cookies after watching all these. The Big Bad Wolf is on the lamb. Special Sheep Agent, Nicholas Ba-a-a-a-rody is the agency's only hope for bringing the Big Bad Wolf to justice. But is he a wolf in sheep's clothing? Or just a sheep in wolf's clothing in sheep's clothing? Legend speaks of a dessert unimaginably sweet and delicious. When it was destroyed all that remained was the dessert's powerful recipe which remained in the hands of a monster named Gobble for a long time. When the recipe disappeared, all of the cookies on Monster Earth disappeared along with it. It is up to Cookie Monster to use his memory to remember the recipe so that he may bake the cookies in the fires of Mount Crumb. The Game of Chairs will determine who will be king or queen of Jesteros. Four players will march around three chairs while music plays until one remains. Who will take the crown in this game of musical chairs? Robb, Cersie, Joffrey, Daeneyrus or….? Cookieness Evereat is back to play in the Hungry Games. Can Cookieness and her friends, Finnicky, Tick Tock Lady, and Pita escape from the poking monkeys and tickling winds? Find out in The Hungry Games: Catching Fur. May the cookies be ever in your flavor. Grouch-B-O presents True Mud: The Yuckiest Show on Television. Only a grouch has an appetite for true mud, not a spud, not cud, not a man named Bud, and certainly not a watch that's a dud! To get to the Goblet of Cookies, Furry Potter must listen carefully to directions. It will take more than a simple Wingardium Leviosa to reach the Goblet. Watch Professor Crumblemore teach Furry Potter the wizardly ways of following instructions in Furry Potter's quest for the Goblet of Cookies! Tea Time. "Upside Downton Abbey" turns right side up. Only the best secret agent could stop Lady Finger's evil plan. Unfortunately, he wasn't available. Can Cookie Monster stop Lady Finger before its too late? Will he listen to directions? Watch carefully.